It was the year 1842, and steamers were exploring the Paci­c Ocean, discovering mysteries and amazing places, leading to beliefs in monsters, curses and exotic beings. Every week, the confused inhabitants of Fiji were visited by arrogant, despotic explorers and scientists, who mistreated them and forced them to work on their dispatches. The despair of the indigenous people to regain the peace that the intruders had put an end to, resulted in a boom in the worshipping of the Fiji mermaid, which had always been an object of devotion on the islands. One of the explorers, Dr. J. Griffin, was so intrigued by the ­gure of the mermaid that he decided to search for it, encouraged by the Fijian belief that the mermaid was a real being. Just when he was beginning to lose hope of ever ­finding her, suddenly, on a quiet beach, he heard a moving song which got louder with every step he took: there she was, the mermaid of the Fiji Islands – more beautiful than he could ever have imagined. It had only lasted a second, just a quick look, but he would never be able to forget what he had felt: he was absolutely enchanted by the beauty of the mermaid of Fiji. No one knows for certain what happened to J. Griffin, whether he lost his mind or whether he forgot his obsession, but some say that he stayed on that beach forever, waiting for the mermaid. 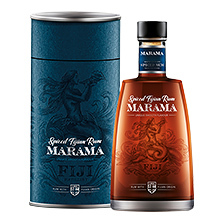 Marama means “lady” in the Fijian language.